Greece has two major financing problems. One is long-term, the other happens right now. Greece's overall debt load of €323 is not sustainable. What cannot be paid back, won't. The current payback schedule on debt owed to the ECB and IMF implies yet another "bailout" to the tune of €53.8 Billion. It is amusing to hear talk of a third bailout given that Greek Prime Minister Alexis Tsipras wants to put an end to the second, and certainly will not accept a third. Yet, here we go again. How Much Would a Third Bailout Cost? 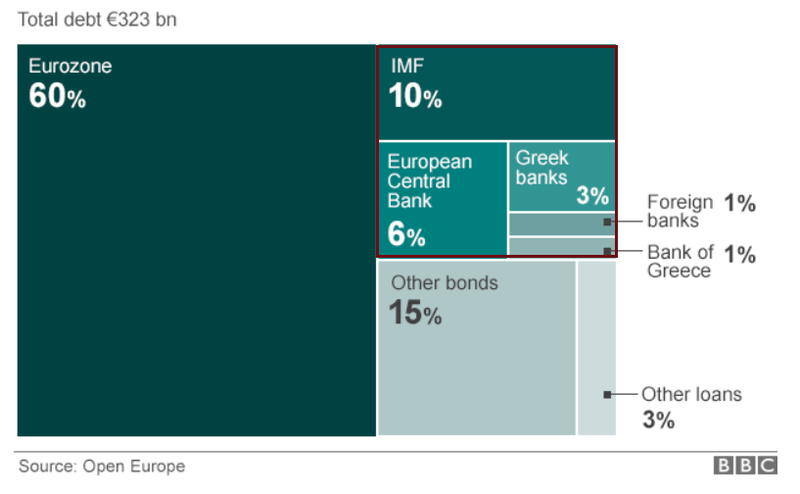 The Financial Times goes over the math in How Much Would a Third Greek Bailout Cost? One of the unmentioned problems looming over the current Greece standoff is the fact that Athens will need a third bailout, regardless of what happens in a week’s worth of Brussels meetings that start on Wednesday. Eurozone officials say that both Yanis Varoufakis, the new Greek finance minister, and his boss, Alexis Tsipras, have acknowledged that in private meetings. Eurozone officials are understandably reluctant to estimate the size of another Greek bailout – and not just for political reasons. Trying to guess how much Athens will need without digging through Greece’s books is a fraught affair, especially since tax revenues have reportedly begun to dry up and it’s been months since the troika did their last full-scale analysis. The Financial Times concludes that a best-case scenario is €37.8bn, assuming healthy tax receipts and solid economic growth that were forecast during the last bailout review even though tax receipts and growth both lag perpetually optimistic projections. 60% of Greek debt is owed to eurozone countries, but in regards to short-term financing needs, there is not a penny of relief to be found. No principal or interest is due until 2017 at the earliest. 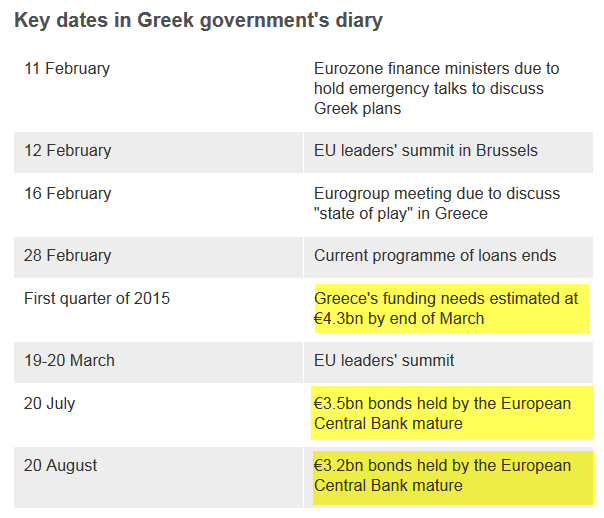 In Greece Presents Bailout Plans to EU Finance Ministers the BBC has a nice table that shows percentages of debt owed. The immediate problem is the upper right quadrant. Where Can Greece Get €11 billion? 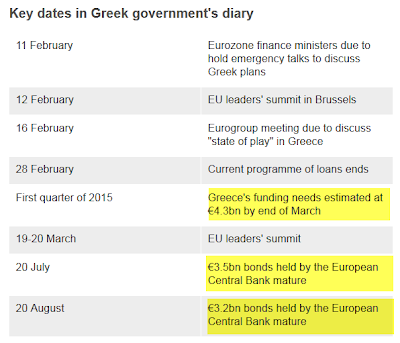 Between March and August, Greece needs to come up with €11 billion. From where? Greek revenues have plunged badly because Greek citizens reacted in advance of Syriza's victory and Tsipras' pledge to cut some taxes. Unless Greece runs a primary account surplus (current account surplus not counting debt payments or interest on debt), it will need external funding. The Wall Street Journal reported Greece Expects Primary Budget Surplus for 2015. Does that take into consideration plunging tax revenues? If not, can Syriza step up collections in time? If the answer to either question is yes, then Greece can walk away and stay on the euro, albeit without the spending programs Tsipras wants.